The second release in the EXP series, the Edge 540T features the same ultra-high quality construction, features and performance that have made the Extra 300 EXP a "must have" for the legions of 3D and aerobatic pilots out there. Every bit as aggressive and nimble as the Extra, the Edge is rock solid in high alpha attitudes and may very well be the easiest plane to harrier in existence. Aggressive knife edge spins, tumbles, waterfalls, walls and heart attacks are all well within the Edge's wide flight envelope. 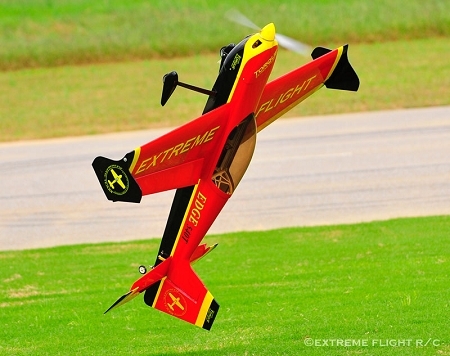 Flip the rate switches to low and the Edge will perform beautiful precision aerobatic maneuvers and make a great sport flyer for pilots who have not yet entered the realm of 3D flight. 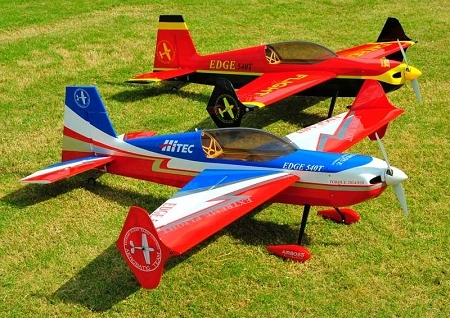 The Edge is packed with unique features like carbon reinforced fuselage assembly, G10 composite reinforced landing gear mounting structure, carbon fiber wing tube, carbon fiber landing gear, carbon fiber micro tailwheel assembly, fiberglass cowl and wheel pants, a set of side force generators, 2 gorgeous high visibility Ultracote color schemes and a complete decal set. The Edge can easily be assembled in a single evening by an experienced modeler. -Forward canopy placement places the tallest portion of the fuselage over the CG, which is optimum for best knife edge performance. -Huge airfoiled control surfaces utilizing geodetic construction provide the ultimate in yaw, pitch and roll authority. -Carbon fiber longerons and motor box supports add enormous strength and rigidity to the airframe, while G10/lite ply composite laminates make for a robust landing gear mount. -One piece airfoiled molded carbon fiber landing gear and tailwheel bracket provide solid ground handling and contribute to the awesome appearance of the EXP. 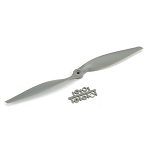 -Long tail moment contributes to rock solid precision flight performance and tracking. -Spring loaded hatch latch provides instant access to battery tray and interior of aircraft while providing a solid attachment point for the canopy. -2 piece wing mounts on a carbon fiber wing tube and is easily removed for transport. -G10 elevator horn bolts on to stock servo arm to allow for insane elevator travel. -Rudder and elevator servo mount in the rear of the aircraft and utilize a short direct drive carbon fiber pushrod with ball link for slop free control surface actuation. -Removable Side Force Generators add tremendously to the effective side area of the EXP increasing rudder authority and improving knife edge and high alpha stability. -2 gorgeous genuine Ultracote color schemes available with expertly painted fiberglass cowl and wheel pants. -Complete hardware package and decal sheet included. -High level of pre-fabrication allows you to get the EXP in the air in as little as 3 hours! Wingspan: 48 inches Length: 48 inches Wing Area: 505 sq. in. Weight: 44-48 oz. Check out our ARF assembly videos. Assembly process is similar for all the 48" Airframes.